Treyarch has announced a Double XP event for Call of Duty: Black Ops 4 Multiplayer this weekend. 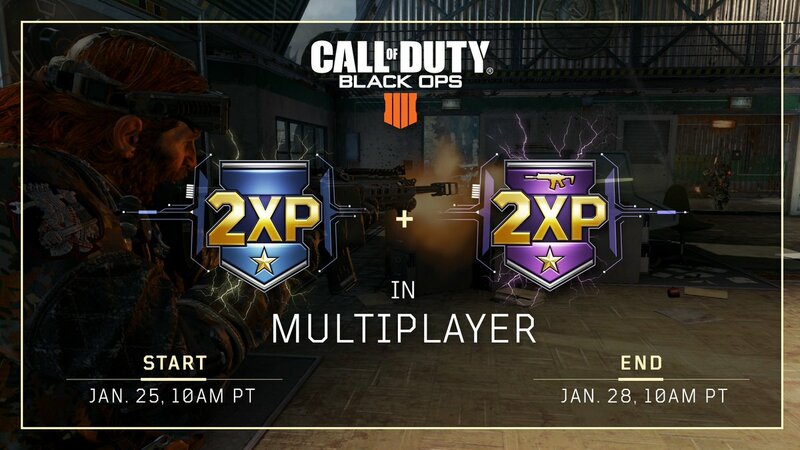 Starting Friday, January 25th at 6PM UK, Treyarch is activating Double XP and Double Weapon XP in MP on all platforms. The Double XP will end on Monday, January 28th at 6PM UK. It has been a while since Treyarch has activated Double XP for MP players, so now’s the chance to get in on the action while it’s live! Couldn’t even load my disc copy of this up tonight. Is that a common thing with this game on busy weekends? Could be the disc or drive ? As my xbox drive wont read disc when unless I wait for the drive to make a screaming noise before I let go of the disc. Sometimes it happens in every cod game, escspally when theres a double xp weekend. Had to reinstall it so dunno what the problem was. Can you explain zombie mode to me? Been playing it and really enjoy it on blops 4 and ww2. Does it ever end or do the waves just keep going until you die? Like you said "the waves just keep going on untill you die". Which I find pointeless at least in Gears of War Horde mode you had to last till 50 waves/round when it finshed. They recently introduce "gauntlets mode" in zombies. We’re excited to debut Gauntlets in Zombies starting with “Unsinkable” in Voyage of Despair! Gauntlets in Zombies are endlessly-replayable, 30-round challenges with unique rules governing gameplay in each round. Players earn medals and tiered rewards for completing rounds 10, 20, and 30, as well as a unique reward to adorn your Emblem for completing round 30 without failing a round. Sound easy? Think again. Really enjoy the zombies but I do struggle with the whole no ending thing. I was looking online and each of the maps have an Easter egg to complete. Looks bloody complicated by the looks of the titanic one.